With today?s World Environment Day high on the corporate social responsibility agenda of governments, companies and NGO?s from around the globe, ?green? business took centre stage. With today"s World Environment Day high on the corporate social responsibility agenda of governments, companies and NGO"s from around the globe, "green" business took centre stage at Posidonia 2008 today as the global maritime community is intensifying its efforts to further reduce its impact on sea and air pollution. ?While shipping"s CO2 footprint is a meagre 4.11 per cent of total emissions despite being accountable for a massive 90 per cent of the transportation of goods and raw materials worldwide, the industry continues to introduce innovative technologies and reinvent business practices in a joint effort to help protect the environment,? 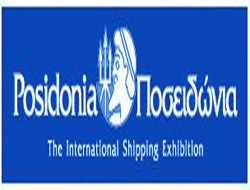 said Themistocles Vokos, Chairman, Posidonia Exhibitions S.A. the organiser of the world"s biggest and most international maritime event being held at the Hellenikon Exhibition Centre (HEC) from June 2 ? 6. ?We are extremely honoured to see the large number of Posidonia 2008 exhibitors showcasing their systems and technology designed to protect the environment.? Classification societies, ship yards, software providers, marine lubricants suppliers, water treatment specialists and pollution control experts are just some of the sectors which have launched environmentally-friendly initiatives at this year"s Posidonia as the industry is now well aware of the increasing evidence of significant cost savings generated through the effective implementation of environmentally-friendly innovations. According to Lloyd"s Register, a cargo ship over 8,000 dwt comparatively consumes eight times less fuel than a midsize truck, a proof point that shipping remains the most efficient, environmentally friendly, and often the only, means of moving freight. ?The next ten years will see further technological changes in energy conservation and emissions control. Large financial savings are possible if the available proven technologies can be brought into service,? said Nicholas Brown, Marine Communications Manager, Lloyd"s Register. The UK-headquartered classification society used Posidonia 2008 as the launch pad for a shipping industry specific guide for the ISO 14001 environmental management standard to enable ship operators establish and implement effective environmental management systems. The pack provides a pragmatic management tool to measure, manage demonstrate and improve environmental performance. And Germanischer Lloyd will present tomorrow (June 5th) its innovative CO2 Index for Shipping, a groundbreaking tool, which according to executive board member Hermann Klein ?it is designed to put environmental protection into practice.? Despite shipping"s relatively low contribution to greenhouse emissions, ships have become the single biggest source of Sulphur dioxide (SO2) in the European Union. According to Posidonia exhibitor BMT SeaTech Ltd, monitoring a vessel"s current performance trend over time is essential for the operator in order to improve fuel efficiency and consequently reduce emissions. At Posidonia 2008, BMT unveiled its SMART Power tool, a system that continuously records ship speed, fuel consumption, shaft power torque and engine RPM together with navigational and environmental parameters in order to present performance trends over time. Posidonia also saw the launch of a new environmental charity for shipping, Greenwave, the brainchild of Greek ship manager Costas Apodiacos. Having only recently been granted UK charity status, the organisation commenced its research and development activities eighteen months ago. According to Greenwave, extensive wind tunnel tests in New Zealand and tank tests at the UK"s Solent University have demonstrated significant savings through the improvement of above-deck aerodynamics. By the end of the year Greenwave will launch its first solutions designed to reduce fossil fuel consumption and emissions by 15 percent. Yesterday also saw the ceremony of the Green Award Certification which was given to Aegean Bulk for its Afovos dry bulk carrier. It is the first time a vessel of this type wins the accolade in the scheme"s 14 year history. The event was held at the Posidonia stand of Norwegian classification society Det Norske Veritas (DNV). People in Greek shipping are becoming increasingly aware on environmental issues and are joining hands with the international maritime community in addressing the environmental challenges facing our planet. This year"s motto of the Hellenic Marine Environment Protection Association (HELMEPA) campaign is "Let"s change habits?not the climate" because improving our environmental conduct is essential for future generations,? said Constantinos Triantafillou, Information Manager, HELMEPA. Posidonia 2008 is sponsored by the Ministry of Mercantile Marine, The Aegean and Island Policy, the Municipality of Piraeus, the Hellenic Chamber of Shipping, the Union of Greek Shipowners, the Greek Shipping Co-operation Committee, the Mediterranean Cargo Vessels Shipowners Union, the Association of Greek Coastal Shipping Companies and the Association of Greek Passenger Shipping Companies.